A few months back, a friend asked me if I could help a photographer translate a few interviews from his trip to Syria and Iraq. I agreed to do it without asking who the photographer was or about the content of the interviews. I assumed it was just yet another repetition of the standard media coverage of the Kurdish people as half terrorists, half allies of the West. Like most Kurds, I follow the situation in Syria and Iraq closely and watch every video and read every reportage about the Kurdish forces and their fight against the Islamic State (IS). Judging from our community on social media, some of us have grown weary of the way the Kurds are portrayed. Their humanity and individuality are lost in the news reports that depict Kurdish fighters as either Western-friendly, gun-wielding IS-slayers or as terrorists who are temporary partners in war. It was a completely different story that unfolded on my laptop when I sat down to translate the short video segments with PKK fighters, YPG/J fighters and a young Yezidi boy reciting his own poems. 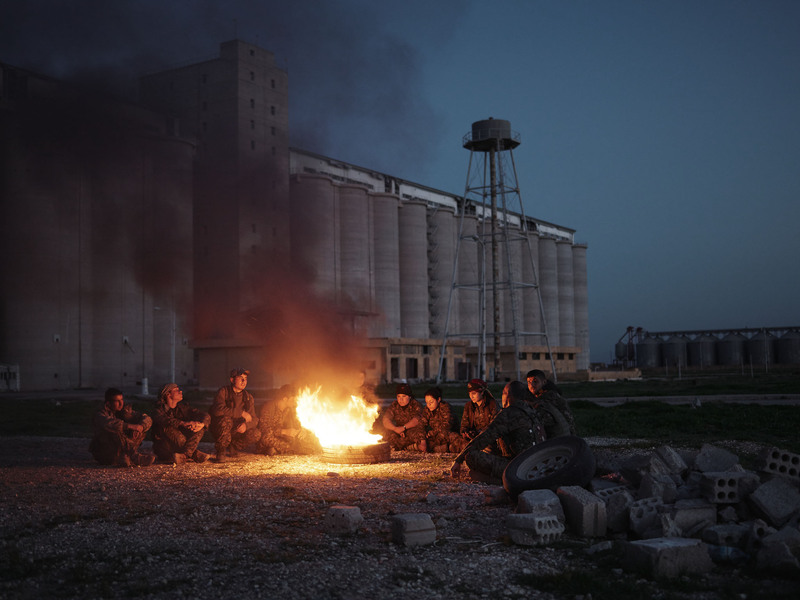 The segments were meant to be put together for a behind-the-scenes video for the main project, the photography series, and hence I saw how the photographer Joey Lawrence, or Joey L. as he goes by, connected with the Kurds like they were friends. The Kurdish fighters became more than just members of a military unit, more than media’s armed femme fatales or secessionist communists. They were Didar, Dilan and Sorxwin. They were the ordinary people from the streets of pre-war Syrian Kurdistan and now the extraordinary people of the Rojava Revolution, one minute joking with Joey and teaching him Kurdish, another talking about what made them join the armed struggle against the Islamic State and the Syrian regime. The project “Guerrilla Fighters of Kurdistan” was one of Joey’s so-called passion projects, done out of own funds and personal interest. His pictures can all be found on his blog and they are accompanied by his insightful descriptions and reflections of his trip to Kurdistan. The project and Joey’s writing were later the cover story of the Independent’s Saturday Magazine, and the images also ran in Vanity Fair: Italia. Naila: So, Joey, tell us a bit about yourself. Joey: I am a Canadian-born photographer based in Brooklyn, New York. I am happily married to my work though sometimes our relationship is also problematic. As the humble fellow he is, he does not mention that he is only 25 years old but has already produced exquisite work for National Geographic Channel and the ACLU, just to name a few. What did you know about the Kurds before you set out on your trip to Kurdistan? Canada is a very multicultural country, and as you probably know there is a large population of Kurds in Toronto. So, I have been aware of the Kurds for a long time. I became particularly interested in the Kurdistan region in 2012 after the escalation of the Syrian Civil War. However, at that time it seemed so far away and too impossibly dangerous to go. So, I followed the conflict closely online. I did a project with the US Army and a friend of mine, a Lieutenant Colonel, would talk a lot about Kurdish history after the photoshoot each day. He had served in Iraq on many tours, and told me about his experiences in great detail. Months later, rather serendipitously, I got in touch with a Kurdish fixer with an equal mix of trustworthiness, experience and contacts. Suddenly, I found myself on a plane to Sulaymaniyah. And what is it that made you want to photograph the Kurdish fighters? The guerrilla groups are extremely fascinating – of course they are photogenic and a dream for a photographer on the outside, but internally they are also ideological warriors, and it is actually this notion which makes them interesting subjects. Yes, there is a political war fought on soil, but this armed conflict is also a manifestation of an internal ideology. I have always been interested in the challenge of trying to visually depict internal struggles with such an outward, seemingly trivial medium like still photography. I have spent my entire career photographing human beings with a serious vocation to a particular vision of life – devoted ascetic monks of India, Ethiopian tribes who strive to protect their unique identity, and other cultural groups around the world. The guerrilla groups are a symbol of Kurdish culture, and oddly enough, they seem to fit alongside the other fascinating groups I have had the privilege to photograph. This doesn’t mean I side with every single aspect of their ideology, in fact there are some beliefs that I do not share with the PKK and YPG/J. However, that’s not what a photographer does. We are more interested in what unites us in humanity than what divides us. 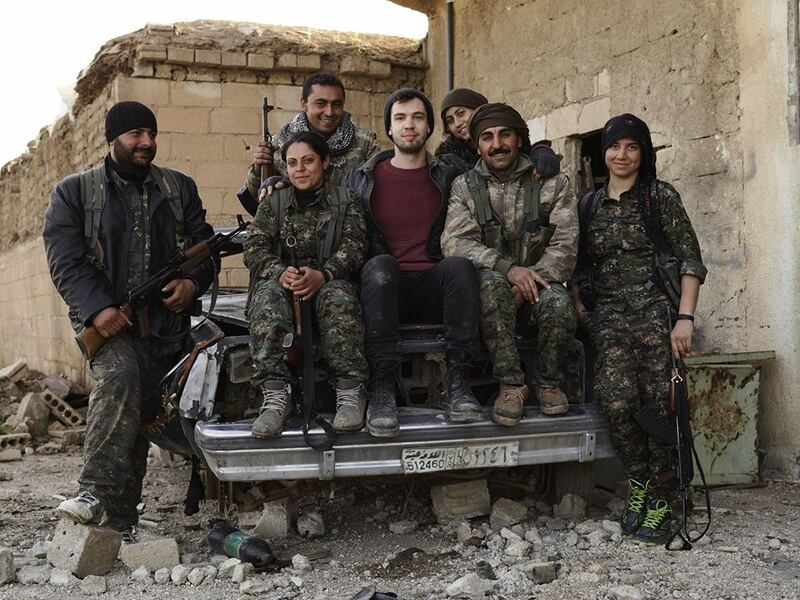 Tell us where you met the Kurdish fighters. How was the situation like between them and Islamic State fighters while you were there? I see the situation with Islamic State as a complete disaster, but also perhaps it’s an opportunity for the Kurds to show their strength and become the authors of their own history. In some of the most dangerous places in the world, I was able to feel protected and carefully watched over by the guerrillas. Unfortunately, I think we all agree that as a foreign photographer I can’t say the same if I had chosen to “embed” with the other side of this particular fight, though I’m sure it would be interesting if it were remotely possible. Around Makhmour, the situation seems to be under control with Peshmerga and PKK making incredible gains. In the Rojava region, there were clashes every day in Tel Tamer between YPG/J and IS, and many deaths on both sides. Since my visit, YPG/J has been successful and the fighting has moved on. Tel Hamis had been liberated by YPG/J just 10 days before my arrival there, so the city was a still ghost town, yet its future was promising compared to other areas of Iraq and Syria. While I was in Shingal (Sinjar), PKK guerrillas, Shengal Resistance Unit and the Peshmerga held approximately 30% of the city, and ISIS roughly 70%. They are still in a bitter stalemate and not much of the city of Shingal has been won or lost since my visit, but there have been a lot of clashes in the countryside. 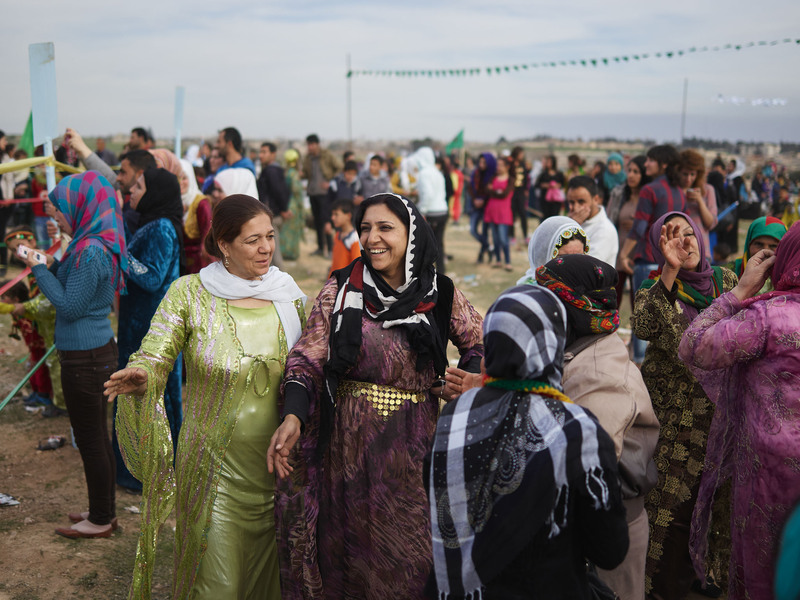 The fight in the Kurdish regions in northern Syria is popularly referred to as the Rojava Revolution. I want to know if you were personally interested in experiencing and photographing basically a historic moment and if so, what it was that intrigued you. Road by road, house by house, hamlet by hamlet, town by town, city by city, canton by canton, YPG/J and their partners in Burkan al-Firat are making gains against IS on the ground almost every day. No matter what your position is on the “Rojava Revolution”, it’s hard to argue that history is unfolding in one way or another. I often think about the places I visited, and how dramatically different they will be in just a few months time. So what is the Rojava Revolution if you had to explain it in your own words? I was in Rojava during International Women’s Day, and I think this was auspicious and fortunate because the ultimate goals of the revolution are on display and extremely clear. Give us an example of these goals. Well, do you think IS is celebrating International Women’s Day? I really enjoyed the part of the video [21.56] when the PKK fighters are messing with you about IS being just a few meters away. To get portraits of fighters, you have to go where the fighters are. Can [Joey’s fixer] asked me if I was okay going close to IS positions that day. I said I was comfortable with that, but out of the fronts we would visit, don’t tell me which one is closest to IS, so that fear won’t get in the way of my photography. In that part of the video, what they are saying is true – they [IS] were incredibly close, and probably even saw the flashes of light. But the glamour session that day was for the guerrillas only, IS has their own media department for that. I am curious to know what made the greatest impression on you during the trip. Through my translator Can, I asked a young PKK member to tell me about some Kurdish folktales. He began to tell me a story of a bloody war between the kingdoms and governments of Arabs, Turks and Kurds. I quickly stopped him and explained that there must have been an error in the translation, and a “folktale” is a cultural tale from a long time ago, not today’s news. Unfortunately, the translation was correct and it seems that Kurdish folktales are also the Kurdish events we see today. I realized that I was witnessing living history with every passing day. Why did you decide to photograph Kurdish fighters and not members of other fighting units? I can obviously imagine it is not ideal to embed with IS fighters but what about moderate Syrian fighters like the Free Syrian Army? As I mentioned before, Kurdish guerrilla fighters are interesting because a photographer needs two things to make an image compelling. The first is visual and outward, and that’s easy. The guerrillas are visually stunning. So, I’ll give you an example- the PKK uniforms are a symbol of Kurdish resistance. Visually, for a photographer they are nice. They have a classic feel with beautiful earth tones that blend into the landscape. But more importantly, what do they represent? When the Kurdish language, cultural activities and traditional clothing was banned in the region, the PKK adapted an otherwise standard Kurdish outfit to become their military uniform. 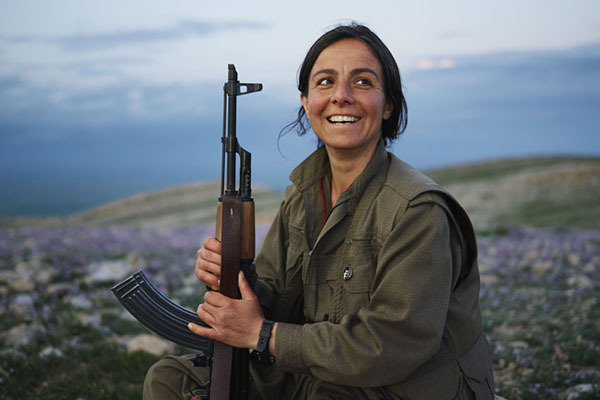 So really, to me a simple portrait of a PKK member in a uniform says two things: Firstly, its color palette attracts the eyes and brings unity to landscape and subject. 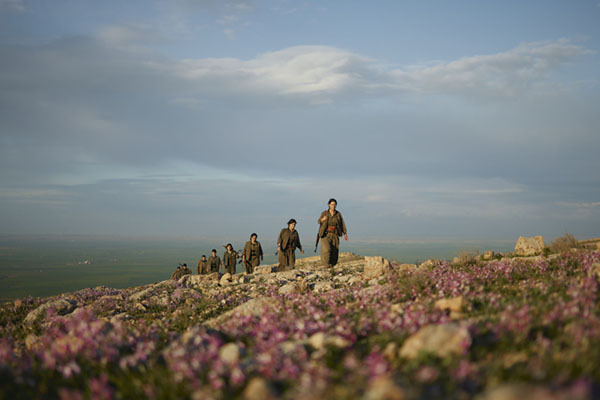 Secondly, we feel a longing for Kurdish identity that has manifested into an armed struggle. With that said, rebel groups like FSA would also be interesting. My first trip to Kurdistan just scratched the surface, and I will return to do work in greater depth. I saw the response online to the video and photographs to be extremely positive, many commenting on how you portrayed the fighters with an integrity that is usually lacking in mainstream media. I am wondering if you have received negative comments. After all, the Kurdish armed is still a controversial subject. When I released the video and photography series, I have to admit I was blown away by the positive feedback. I can’t say I’ve ever released a personal project and got that kind of response. I am continually thankful for the kind messages I receive and it gives me the fire I need to work on future projects like it. But with this territory, there are some more sinister actors that come forward as well. I’ve been tweeted threats from IS supporters, emailed pictures of Kurdish fighter’s corpses, and there are a few very hateful comments on my Facebook page by people who openly support IS; their names and profile pictures in plain sight. I choose to leave all of those comments up. Obviously, free speech allows viewpoints you don’t agree with and by leaving them up, people can make up their own mind. Another common thing online is from people who think they are the first person to make aware that the PKK is listed as a terrorist organization. They clearly have not read my article and have probably not watched the video, because I actually acknowledge the exact points they make. I am in support of open dialogue and critical debate on these issues. Unfortunately, the majority of these commentators are just racist and not looking to pursue a conversation. In my opinion, war is not black or white, but grey. To reduce any group fighting in Iraq or Syria to the term “terrorist” denies a critical understanding of nuance. You can follow Joey on his blog or his Twitter.